Franz Boas, the “founding father” of North American anthropology, has long been credited with many pioneer contributions to the field of Arctic anthropology, as a result of his first and only fieldwork among the Inuit on Baffin Island, following the First International Polar Year 1882–1883. In this new “polar year” the SIKU project has initiated several studies of the Inuit terminology for sea ice and snow, including in the areas of Baffin Island once surveyed by Boas, as well as in the nearby regions of Nunavut, Nunavik, Labrador, and Greenland. Also, in the past decade the story of Boas’ fieldwork on Baffin Island has become known in full, in diaries, personal letters, and field notes. 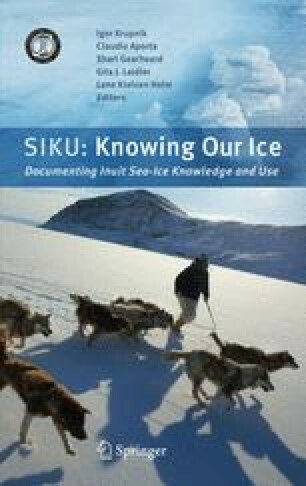 This chapter capitalizes on these new sources: it examines Boas’ knowledge of the Inuit terminology for sea ice and snow and its value to current discussion about language, indigenous knowledge, the Inuit, and beyond. It also addresses the so-called Great Eskimo Vocabulary Hoax debate of the past decades that misconstrues Boas’ use of the Inuit terms and the analysis of the contemporary Inuit ice and snow vocabulary. We are grateful to our colleagues, Claudio Aporta, Ernest S. Burch, Jr., Louis-Jacques Dorais, Ives Goddard, and Michael Krauss for many valuable comments to the first draft of this chapter. Mark Halpern was a source of inspiration on many issues related to the “Great Eskimo Vocabulary Hoax” debate. Matthew Sturm shared with us his lexicon of the Inuit/Inupiaq terms for snow collected among knowledgeable elders in Barrow, Alaska; and Noel Broadbent shared and translated the Swedish list of ice terms from Edlund’s dissertation (2000). Our colleagues in the SIKU project – Claudio Aporta, Ron Brower, Gita Laidler, and Pierre Taverniers – kindly offered Inuit ice vocabularies they collected in 2003–2008 in Igloolik, Barrow, Pangnirtung, and Qeqertaq, respectively, for our comparative analysis with Franz Boas’ 1894 lexicon. All shortcomings in interpreting the Inuit knowledge or ice and snow are of our own. Anonymous. N.d. Glossary (of) Snow and Avalanches. Working group (of the) European Avalanche Forecasting Services. WSL Institute for Snow and Avalanche Research, Davos, Switzerland. http://waarchiv.slf.ch/index.php?id=278#5416 (Accessed May 9, 2009). Brower, R., Jr. 2008. (Barrow) Inupiaq snow terminology. In Light Snow, Deep for Walking. M. Sanchez, Weekend America, January 12. http://weekendamerica.publicradio.org/display/web/2008/01/11/snowwords/ (Accessed April 27, 2009). Fayhee, J.M. 2009. Snow by Any Other Name. Mountain Gazette 151. http://www.mountaingazette.com/exclusive/features/snow_by_any_other_name. Kaplan, L. 2005/2008. Inuit Snow Terms: How Many and What does it Mean? http://www.uaf.edu/anlc/snow.html#citation (Accessed April 26, 2009). Laidler, G.J. 2007. Ice, Through Inuit Eyes: Characterizing the Importance of Sea Ice Processes, Use and Change Around Three Nunavut Commuties. Unpublished Ph.D. Thesis, Department of Georgraphy, University of Toronto (Accessed July 14, 2009 at http://eratos.erin.utoronto.ca/robinson/dissertation/). Liberman, M., 2003. 88 English Words from Snow. Language Log December 7, 2003 (Accessed April 26, 2009 – http://itre.cis.upenn.edu/~myl/languagelog/archives/000200.html). Liberman, M. 2006. The Proper Treatment of Snowclones in Ordinary English. Language Log, February 4, 2006 – Accessed April 26, 2009 http://itre.cis.upenn.edu/~myl/languagelog/archives/002806.html. Muldrew, K. 1997/2000. A Lexicon of Snow. http://www.ucalgary.ca/~kmuldrew/cryo_course/snow_words.html (Accessed May 10, 2009). Pullum, G. 2003. Bleached conditionals. Language Log (October 21) http://itre.cis.upenn.edu/~myl/languagelog/archives/000049.html (Accessed April 26, 2009). Woodbury, A. 1991. Eskimo Words for ‘Snow’. Linguist List 5-1239 (Accessed April 26, 2009) http://www.ecst.csuchico.edu/~atman/Misc/eskimo-snow-words.html. Woodbury, A. 1994. [Tony Woodbury’s] ‘Snow’ lexemes in Yup’ik [Accessed June 15, 2009] http://www.prairienet.org/prairienations/woodbury.htm.